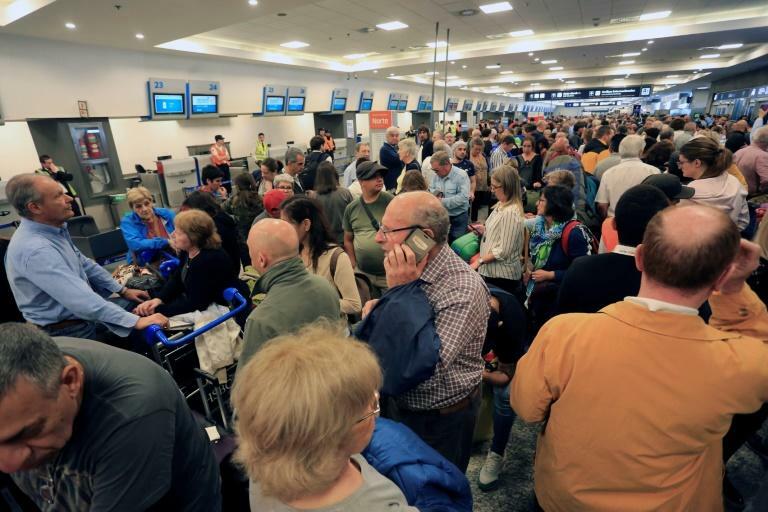 A wildcat strike by workers at Aerolineas Argentinas over wage increases left thousands of passengers stranded at airports across the country Thursday, the company said. "There are no flights. The company's employees are refusing to fly, there are 15,000 stranded passengers," said company spokesman Marcelo Canton. "None of the employees are working at the moment. There are 12,500 employees in the company on strike," he said. The airline said the unannounced strike was illegal as it had been given any warning of the action. The Argentine carrier was privatized in the 1990s, but re-nationalised in 2018. Center-right President Mauricio Macri -- who has presided over thousands of state-sector job cuts as part of an austerity program driven by a $56 billion International Monetary Fund loan -- has called for the indebted company to be self-financing. "I would ask them on behalf of all Argentines that they sit down with the authorities and work together so that Aerolineas can fly as soon as possible without asking the state for money, something that is achieved by the vast majority of the world's airlines," Macri said. Macri's government has allowed low-cost carriers like Norwegian Air and FlyBondi to compete with the state airline on dozens of routes. Salary increases in the country have been unable to keep pace with inflation, which is running at more than 40 percent.